When you give a gift, really give it away. Never give it with strings attached. That expectation of something coming back in return will lead to disappointment. It will definitely kill your joy. 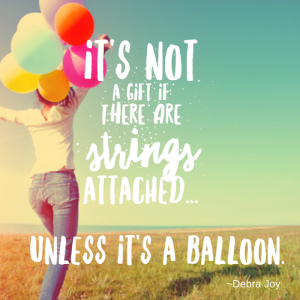 When you give a gift… Let Go. Let Go. Let Go. There’s a way to give a gift that will kill your joy. There’s a way that will make your heart soar. PS. The same thing goes for accepting gifts. Never take one with strings attached. It’s not really a gift. Your sensuality can bring peace to the world. My sister gave me a little money.I told her I would pay it back but she insisted it was not a loan. I spent part of it for what it was intended for,and the rest on something else.When she found out,she blew up at me and accused me of being disrespectful. That is really tough when you get mixed messages like that. At times we all have expectations that we aren’t even aware of, and they always lead to disappointment and frustration. It sounds like your sister might have been experiencing that. She wanted to be unattached to how you spent the money. She wanted it to be a gift, but there were underlying expectations of how you should use it. I’m sorry you went through that experience. I don’t know your sister, but if possible, it can be good to see that behaviour as a moment in time, just an experience, and not the sum total of who your sister is. We all act in ways that aren’t our best selves at time. Yours was a great real-life example of what it’s like when gifts are given with strings attached. Even if the strings were invisible. Thanks for your comment.